These represent the KPIs we've identified as the most important (or key) metrics for you to track. These Key Performance Indicators (KPIs) are available in the form of reports within a practice management system (PMS) or central electronic health record (D-EHR). However, the reports are not always available, depending on the system. Your software may need to be supplemented for reports using additional software like Excel or another statistical tool. Today's dentist needs to track the growth of his or her practice and take corrective actions in time to stay profitable. However, in our experience, most practices are under-prepared for such a dynamic action plan. Further, the new practice owners—starting new or purchasing an existing practice—must be prepared to track these critical KPI's to plan for gross profit margins and break-even. 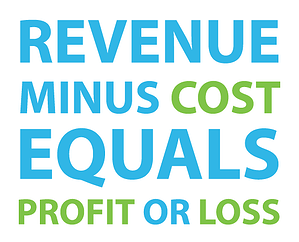 Let's get into the details of profit and loss and cash flow accounting. Firstly, let's get Cost (C) out of our way, which most of the practices have good command. The fixed cost like office lease, utilities, loan re-payments, staff salaries and other overhead, is straightforward and accurately predictable. The variable costs are a small percentage of total revenue due to nature of the business, and easy to predict (e.g. disposable inventory based on the number of patients per month). The relationship is quite simple, the number of patient visits—new or recare—multiplied by treatment cost is equal to production. Hence, to track the patient visits per month and source of those patients can't be overlooked. If a practice has this data in real-time then these drivers can be leveraged to increase the production. For example, new patients' rate planned through additional networking or referral, Facebook advertisements, SEO, etc. If you know where your patients are coming from, you can scale up. Lastly, tracking the rate of collection and cycle-time of accounts receivable is critical to keep positive cash-flow. To explain these interdependent variables we generally ask how fast a practice can collect either from patient or insurance? Generally, these receivables can take anywhere from 15 to 90+ days to collect. The longer it takes, the higher the strain on cash-flow because a practice is spending money today but collecting later. The patient collection cycle-time can be managed by collecting co-payments during the visit, giving a cash discount for an upfront payment, accepting credit cards, and more. It is critical to track these key performance indicators (KPIs) for a practice to plan ahead and keep focused on the growth. If you need help with these metrics, tab32 provides an out-of-box intelligent dashboard to track these key metrics and many other drivers with the help of over 50+ graphs. We want to help your practice succeed. 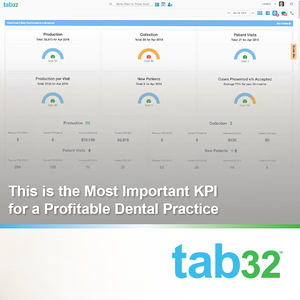 Contact us for a free demo and learn how tab32 is the perfect partner for your practice management. tab32 blog will cover latest technology, healthcare, HIPAA, and HITECH news and information for dental practioners.